The National Academy of Sciences Building on Constitution Avenue in Washington, DC had served the Academy and the National Research Council since its dedication in 1924. The building's restoration, urgently required after decades of use, was initiated in June 2010, and the building was reopened in April 2012 for the Annual Spring Meeting of the NAS. At the business meeting, Frank Press, the 19th president of the Academy, proposed a resolution commending Ralph J. Cicerone, the sitting president of the Academy, “… for the successful restoration of the National Academy of Sciences Building …” and further expressing admiration and appreciation for his leadership in fulfilling the vision of a restoration to “… honor the grandeur and history of the building, while preparing it for another century of service to the academy and to the nation.” Carol Cicerone, wife of the president, was commended for her devotion to the project. The resolution was unanimously approved. 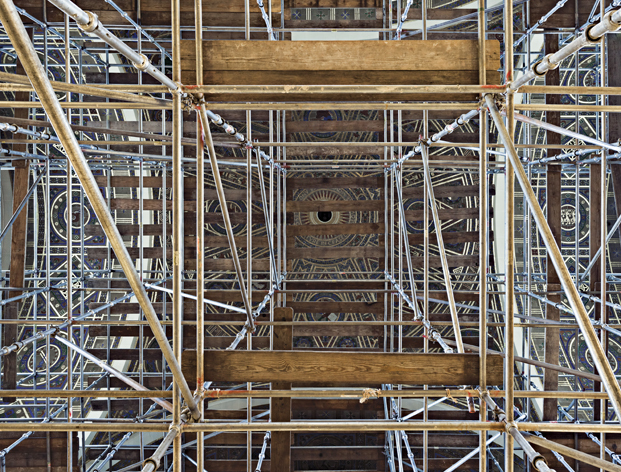 This photograph shows the Great Hall's ceiling partially obscured by scaffolding erected during the restoration of the NAS Building. Gregory Vershbow, National Academy of Sciences, Great Hall Restoration, 2011, Archival inkjet print, NAS Collection.